This volume explores contemporary issues of ethnic, cultural, and national identities and their influence on the social construction of identity. These issues are analyzed from the perspective of seven nations: China, Israel, Japan, South Africa, Ukraine, Wales, and the United States. While different, these perspectives are not mutually exclusive lenses through which to review the discourse between ethnic and educational dynamics. The chapters in this book illustrate how these seven perspectives differ, as well as overlap. *Part I explores ethnicity and race as important variables in explaining minority students' academic performance and schooling in the United States and China. *Part II focuses on ethnic and racial identity issues in Israel, Japan, and South Africa. *Part III addresses ethnic and racial identity as it affects racial integration at different levels of education in post-apartheid South Africa, and the effects on schooling of a rapidly changing ethnic map in the United States. *Part IV focuses on issues of language and national identity in three countries: Ukraine and Wales, where a national language is central to nation-building, and China, where 61 languages are in use and bilingual education is essential in enhancing national literacy and communication. The questions this book addresses are highly significant in today's global economy and culture. 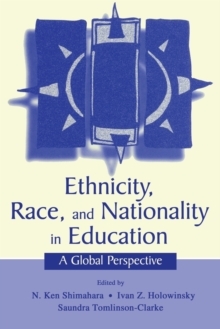 Scholars and professionals in the fields of comparative, international, and multicultural education and educational policy will find the volume particularly pertinent.